One of my biggest frustrations is that I have so much trouble sharing my favorite hobby with my buddies, especially my longtime friends living a thousand miles to the south! I like to send out photos with pictures of fish that I’ve been lucky enough to land. This practice drives my wife nuts. “Why do you take pictures of all those fish? They all look alike,” she says with disgust when I tie up the computer to send them off to my old-time pals. She also has trouble with my efforts to weigh and measure my catches. Especially since that goops up her tape measure and kitchen scale! But I usually get a lot of positive response and envious remarks from other anglers. “Wishing I was there with you!” they say. But it takes a lot of effort to get up here to the Pacific Northwest, and I don’t get to share my adventures as often as I wish. A few months ago, I got an email from my friend Phil Nemir down in Susanville: “I’m coming up to Oregon in a few weeks and will come by and fish with you, save me a few salmon!” Wow, great news, we’d have a ball. Phil and I lived together when we were students down at Berkeley; we always had a great time playing outdoors. The fishing season had been amazing. The beaches of the Columbia were kicking in record numbers of salmon, providing me with a great chance to share a terrific fishing experience. The only problem was, by the date on the calendar that Phil would get here, the run was usually over. I had some backup plans, but I was hoping against hope that we’d still have fish streaming up the river on his arrival date. My luck was holding. Phil would be arriving in mid-October and fish were still coming in strong. Normally I’d be done by the middle of September and would follow the salmon up to the little streams, but the big run was still bringing in a lot of fish and catches were good. Each day that the run held, I’d hope that a good number would still be around to celebrate Phil’s arrival. As the day grew close, another problem presented itself. We were having some October storms and the east wind was making fishing a real challenge. Waves were so high and the wind off the water so strong that I couldn’t even get a cast out far enough to give me any fishing time. High surf would throw the lure right back in my face. A couple of days, I was the only one still trying on the whole beach. The day before Phil got to Astoria was unfishable even for me. Things looked pretty blustery too when he arrived at the house. We unloaded his gear, had lunch and then headed out for the tackle shop to buy him a license for the three days he could spend with us. I insisted on buying, that way I wouldn’t feel so bad if he got skunked! We drove out to the beach at Ft. Stevens. I was pretty pensive, especially when I saw the whitecaps kicking up in the trestle bay, just half a mile away from the beach. My heart really sank when I saw the parking lot looming in the distance. A few days before, I had hoped that it wouldn’t be too full of cars, reducing my chances of getting a good fishing spot. On this day, there wasn’t a car on the asphalt! It was not looking good. We parked, grabbed the fishing gear, and walked over toward the river. We followed the trail out over the spit and then hiked up the last dune. The wind slammed us. My fishing bag darn near blew away. To make matters worse, I could see that the high tide had left little beach for us to work with. The spot where we emerged was catching too much wind to cast. We put our heads into the wind and made our way back down the river. Downstream where the river took a little bend, we’d get a better break with wind and waves. We climbed over some driftwood and found the only place on the river that looked halfway fishable. I gave Phil one of my rod and reel outfits and a few pointers about where he might want to cast. He took the rod and gave me a blank look. “How does this reel work?” he asked. “Was there a picture of Snoopy on the side?” I asked sarcastically. I’d used a nice little Zebco with the button when I was 10, but never for anything bigger than perch! But true to his story, Phil proceeded to show me that he had no skills at all! Half of his casts ended up on the beach behind him, and others went into the driftwood. But, as behooves a former champion athlete (Phil was Cal’s best boxer), within a few minutes he was bombing casts way out into the crashing waves. If there were any fish that could handle the storm surf well enough to see a lure, he was in position to catch it! We had a great time, laughing as we watched the seabirds flashing overhead, using the high winds to do their highflying routines. A couple of seals popped up a hundred yards out. Even they were avoiding the crashing waves near shore. Phil did manage to dredge up a crab from the sandy bottom—at least he was getting deep enough! But I was despairing of us having much chance of landing anything more noble! Gladly, I was way wrong! As I was tossing my lure far out into the surf, I heard a yell from behind me. “I’ve got a fish on,” screamed Phil over the sound of waves and wind. I looked back and saw him holding tightly to his rod as it bent deep, bowing to the maelstrom boiling in front of us. Sure enough, I caught a flash of silver, well out into the surf. A couple of minutes later, a big coho salmon rolled on top, dove and took out line. Like a fool I yelled a bunch of useless instructions to my pal, threw my rod on a driftwood log, and headed down the beach to help with the landing. Usually, getting the fish beached is no chore. The beach is a clear stretch of sand, almost no rocks and no problems. But with the high tide, the only beach we had left to us was littered with limbs and trunks of washed up driftwood and uprooted trees. Phil pulled the fish up onto the wet sand and I tried to kick it up the beach farther, got hit by a wave and darn near snapped the line. When I recovered, I couldn’t see the fish anymore. Phil yelled over to me, “It’s trapped behind that log.” I took a step and saw his line disappear behind a big chunk of driftwood. Fearing the worst, I stumbled over to the brush and saw the big fish stuck in a crevasse underneath the wood. This fish wouldn’t get away! It was too big a long shot, too good a story! I dove down on the sand and trapped the fish with my knees. A big wave washed over it, but I held my ground and managed to get a finger under the gill plate as the wave receded. Struggling to my feet, I got the fish up to the grass just above the beach. 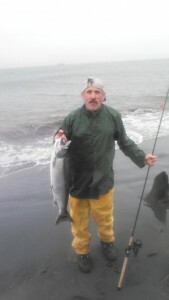 It was a beauty, a shining chrome coho of better than 10 pounds, a great fish to top off a great story! It was a nice hatchery fish, one we could keep and enjoy, and would grace our grill later that night! During Phil’s visit the water improved, he hooked several other fish, including a monster chinook that I managed to help him break off, but this “storm tempered” salmon was the perfect catch. Alone on the beach, during a huge tide and a driving wind, my buddy had landed a beauty. It doesn’t get much better than that!